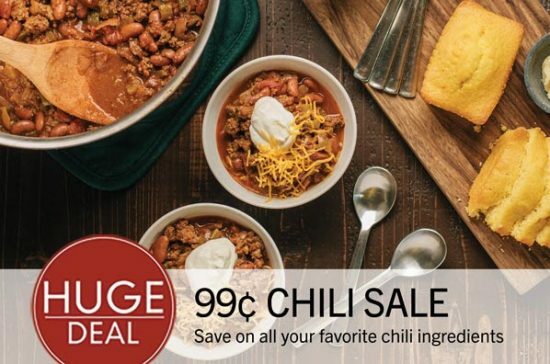 This week Lunds & Byerlys is running a 99¢ Chili Sale in which select chili-related items are priced at 99¢ each (or 2/99¢), no additional purchase or coupon required, while supplies last! Prices are good through November 7th, 2018. 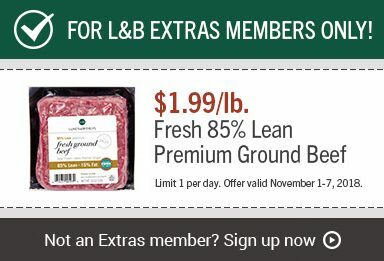 While you’re there, Lunds & Byerlys Extras members can get Honeysuckle Frozen Turkey for $0.69/lb (limit 1), $3 off a Big Bowl purchase of $8.98 or more (limit 1), or Fresh 85% Lean Premium Ground Beef for $1.99/lb (limit 1 per day). It’s free to join L&B Extras. Lunds & Byerlys may not be known for having low prices, but they often have some really great sales! 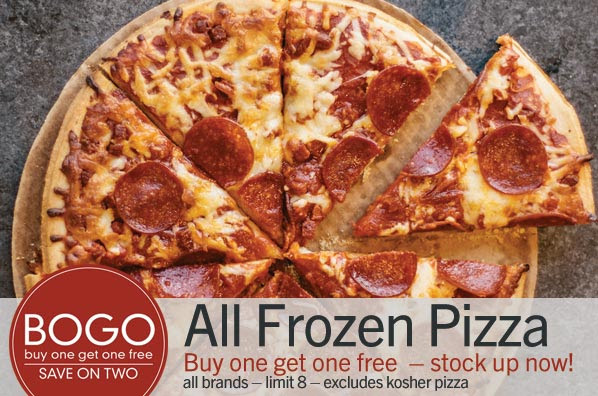 Case in point: this week they are having a Buy One Get One Free sale on all brands of frozen pizza, limit 8 per customer. Sale is valid through Wednesday, October 31. While you’re there, Lunds & Byerlys Extras members can get a 4/$8 deal on Pepsi and bubly Sparkling Water 12-packs (limit 4) and/or Lunds & Byerlys Tortilla Chips for $1.49 (limit 1 per day). It’s free to join L&B Extras. Lunds & Byerlys may not be known for having low prices, but they often have some really great sales! 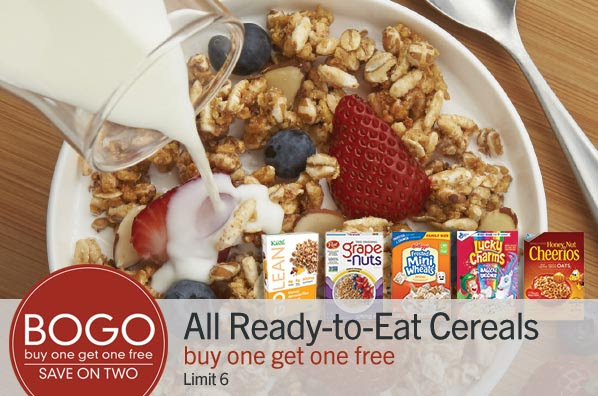 Case in point: this week they are having a Buy One Get One Free sale on all ready-to-eat cereals, limit 6 per customer. 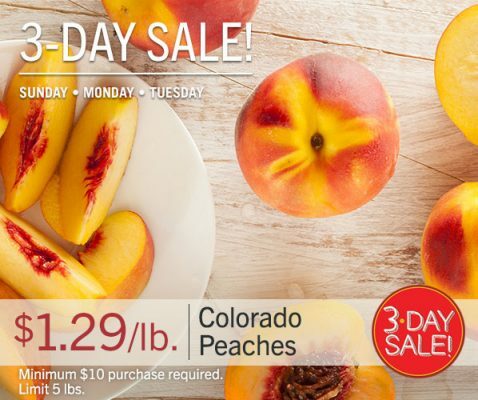 Sale is valid through Wednesday, August 29. While you’re there, get a FREE Sargento Shredded Cheese (7-8 oz.) with a $10 purchase when you present this printable Lunds & Byerlys coupon. Plus, sign up for Lunds & Byerlys Extras program (it’s free!) for other offers and coupons including L&B Signature Cookies (5 ct) for just $1.99. Stock up on beverages this weekend at Cub Foods with their 3-Day Hydration Sale from Friday, August 3 through Sunday, August 5! They have some great prices on a variety of beverages to quench your thirst. PS – Don’t forget to add this week’s Friday Freebie to your card! 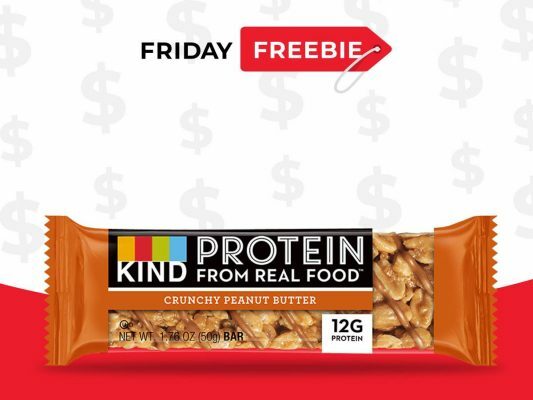 Today’s offer is for a FREE KIND Protein Bar. It’s time for a deli or bakery treat! 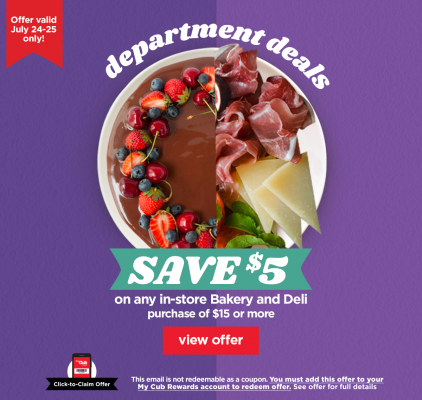 On 7/24 and 7/25, you can save $5 off your in-store Bakery and Deli purchase of $15 or more* at Cub Foods. You’ll need to add this offer to your My Cub Rewards card and have the cashier scan your card before you check out. *Offer is valid with a $15 or more in-store purchase requirement. $15 may include deli and bakery. Must clip offer to My Cub Rewards account to receive discount. Discount taken at register. Cannot be combined with a similar store offer. Limit 1 coupon per customer. Valid at all Cub grocery locations. One time use only. Lunds & Byerlys may not be known for having low prices, but they often have some really great sales! 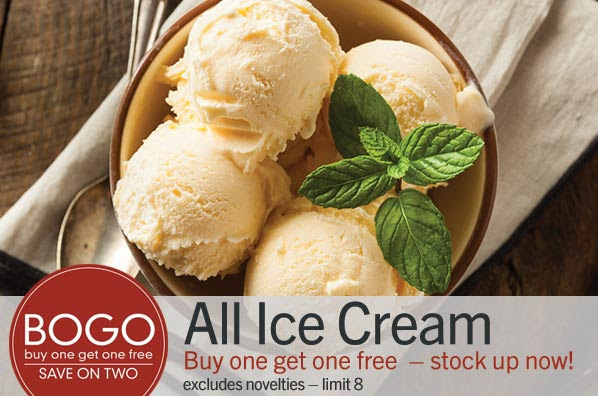 Case in point: this week they are having a Buy One Get One Free sale on all brands of ice cream, limit 8 per customer (excludes novelties). Sale is valid through Wednesday, July 25. While you’re there, get a 12-oz. of L&B Pulled Chicken for only $4.99 with a $10 purchase when you this printable Lunds & Byerlys coupon. Time to stock up on meat! 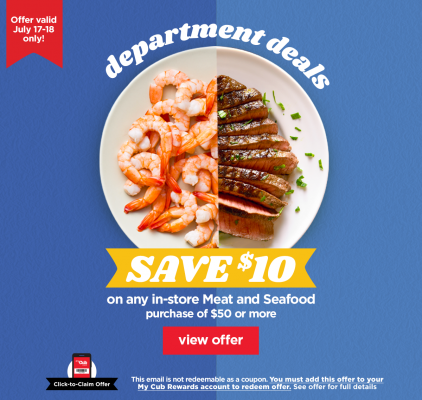 On 7/17 and 7/18, you can save $10 off your in-store Meat and Seafood purchase of $50 or more* at Cub Foods. You’ll need to add this offer to your My Cub Rewards card and have the cashier scan your card before you check out. *Offer is valid with a $50 purchase or more in-store purchase requirement. $50 may include meat, packaged meat, and seafood. Must clip offer to My Cub Rewards account to receive discount. Discount taken at register. Limit one discount per family per visit. Cannot be combined with a similar store offer. Limit 1 coupon per customer. Valid at all Cub grocery locations. One time use only. 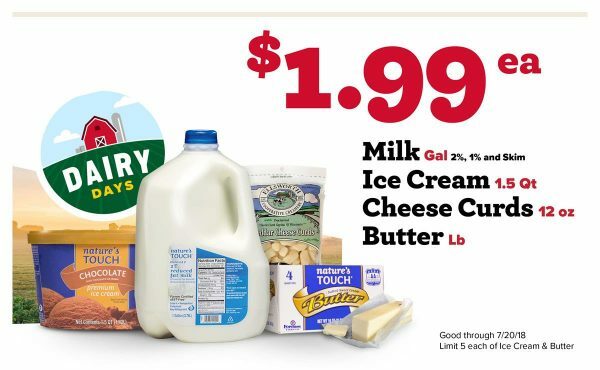 If you haven’t been to Kwik Trip lately, I encourage you to stop by as they have some great prices on dairy items through July 20! No coupon is necessary to get these sale prices. There is a limit of 5 each on the ice cream, butter, and bacon.